The haute couture fashion week is over today, but this year I had the great pleasure of attending a fashion show. It was held by Frank Sorbier, a very talented French designer at Théâtre Antoine in the 10th arrondissement and was "powered" by Intel. 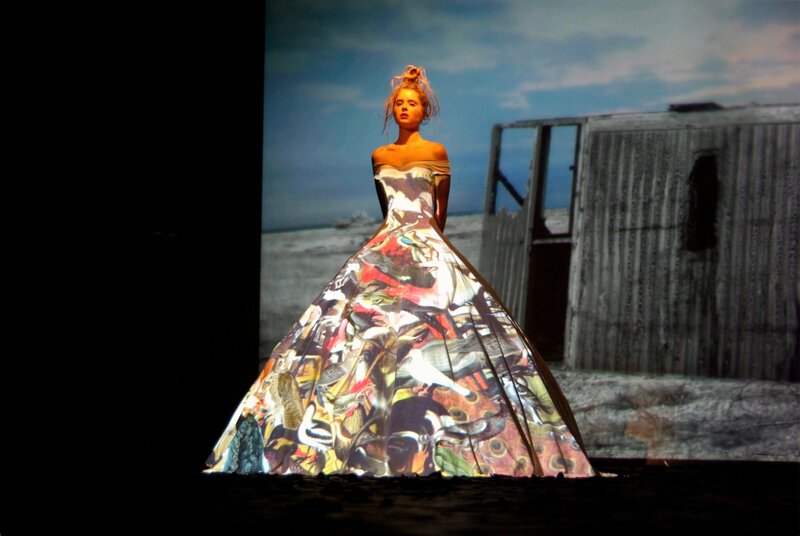 When I say powered, I really mean powered, as it was based on a pretty clever idea: a model, dressed in beautiful white dress was standing on one side of the stage, while another one, also on stage, would trigger the video projection of various creative haute couture motives on her dress. How? Simply by typing a command on her computer (Intel based no doubt!). A bit far fteched maybe, but the show was really stunning; the audience was lead to think she was changing dress every 30 seconds! You MUST have a look at the little video I made, even though you're not that much into haute couture! Fascinating! I wouldn't have been able to take my eyes off of her. I need the exact opposite technology.I would like to put my clothes in a stagnant place and then project an image of my body moving around. At my desk working would be my scene of choice. Suzy what a great idea. Eric I'd have loved to be there. The dress you photographed is the best one! It was so good of you to link to Charlie's work yesterday ;) He's good, isn't he! Such a cool idea! Video is awesome as well! Wouldn't it be fun to only have to own a couple of outfits that you could completely change the look of with the click of a button? It's all fascinating -- the dress, the images, your video! Really creative idea for a fashion show. The poor model looks bored as can be, but that's life. Ah, "Fashion Week" work, work, work for me. Merci for your photo. Thanks for the video.. You were right, even if you are not into haute couture that video is a definite must see.. This was very, very clever! Eric, how long did the model stay immobile? I like what's on the other models too. Eric I sat down at my computer at about 6 am (Toronto time) and was delighted by such ingenuity. What a great way to start the day thinking differently. Now back to writing about antique typewriters. Terrific dress, but why are models always lokking so... tormented? It seems great work to me to show these pieces of art. my favourite is the gold and red one..but also the one you took the photo off..
Merci for sharing Eric...and to get to know Frank Sorbier..
That is why I fell in love with Haute Couture! The French are the originators and they always bring it! Thanks for sharing!! @ET Suzy. " I wouldn't have been able to take my eyes off of her." Actually I do regret I spent more time looking at her through my camera than fro real! @Lynn. "It was so good of you to link to Charlie's work yesterday ;) He's good, isn't he!" yes, I do think so, seriously. Can't wait for my T-Shirt. @Monnica "Wouldn't it be fun to only have to own a couple of outfits that you could completely change the look of with the click of a button?" Wait 5 to 10 years and it'll come. The technology is there: e-ink and e-paper. Only slightly expensive for now. @Jeff "The poor model looks bored as can be, but that's life." Isn't it what they are supposed to look like?! @Lois "Ah, "Fashion Week" work, work, work for me." Really? Why?! @Cindy "Thanks for the video.. You were right, even if you are not into haute couture that video is a definite must see..." Told you! @Janet "Eric, how long did the model stay immobile" 15 minutes roughly. Not too long. @Norman "PS ParisDailyPhoto is always one of the first things I look at each morning. Always a good start to the day" Funny, because I hear that a lot. And I like to hear it, it means I don't do all this for nothing! @TiburgDP "Terrific dress, but why are models always looking so... tormented" Well tormented or bored, but always very beautiful, aren't they? @Cindi "The French are the originators and they always bring it!" I must say, this is one of the rare domain in which we do excel I dare saying. @Kris "Very, very clever!" Yes and probably needed a lot of work and rehearsal time. Ah, but I am into haute couture. Well, not for me to wear, but . . . So I love this very different kind of défilé—glad you got to attend! So original, so French..Loved the video! The most beautiful bridge in Paris ?